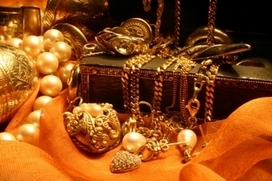 Indian Trade or Indian Diamond Trading goes back as far as before the 17th Century. India is where diamonds were first discovered and for awhile, this country was the only source for gemstones in the world, until, gems were discovered and mined in South Africa, Angola, Sierra Leone, Russia, Australia, South America and other countries. These gems were traded mostly in Western Europe. Venice was the leading port for gemstones entering in and out of Western Europe. In the early days, gemstones were mined from different regions such as, Golconda, Hindostan, and Raolconda. Most of India's gems were alluvial deposits instead of Kimberlite. Many of the stones found in the alluvial regions were the famous ones such as, the Hope Diamond, Koh-i-Noor, Orlov Diamond, and Sanc Diamond. These stones were known as the "Golconda Diamonds," because they were found there. In 1739, a rare blue diamond weighed 186 carats, called the Darya-i-Nur (Sea of Light) was once owned by the Nadir Shah of Persia. It was ravaged from the 'Great Mughal Emperor,' Aurangzeb's heirs in the ruins of Delhi. Diamonds in Golconda were created from enormous forces originated by the 'Tethys Oceanic Crust' which collided and was subducted under the plate tectonics in the Asian continent. These plates collided at a slow rate of 10 centimetres per year, and it was enough of a force to create the Himalayan Mountain range over 100 million years. These forces caused the volcanic activity to create diamondiferous intrusive and extrusive igneous rocks known as kimberlite. 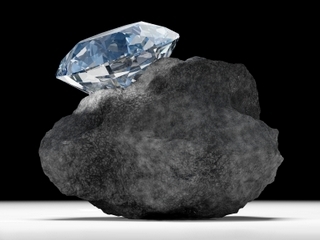 The rainfall, snowmelt and millions of years of erosion caused the diamonds to be unearthed from their kimberlite source. They were washed downstream into the alluvial river gravels of the Golconda region, which is located between the lower reaches of the Godavari and Krishna rivers. Today, Golconda region is the state of Andhra Pradesh in central India. The exact source of the 'lost mines of Golconda' are unknown, the only remaining source is the Majhgawan pipe in Panna. Indian trading, might have, begun in the 1950's when a young man from Antwerp, Belgium decided to take rough diamonds classified as in-betweens, which were in the gray-area in the diamond industry, to India for the Indian laborers to craft them. The laborers were fine with polishing smaller gemstones and making them beautiful. Labor in India was also very low cost. This started something huge in the diamond market, where these small diamonds were sold globally in supermarkets and consumed by the average teenager, not just sold as big exotic rocks to the upperclass. In the diamond industry before the 1950's, diamonds were classified in three (3) groups: gems, industrial and the in-betweens. Most diamonds were traded through DeBeers (DTC). They were polished and cutted in Europe and Israel. This revolution of diamonds being polished by Indian laborers, has been a dramatic event as 11 out of 12 diamonds are polished in India bringing their revenue to $10 billion dollars per year from Indian trades. 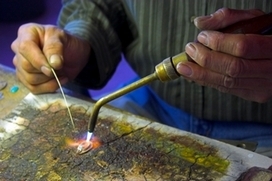 The other 1/12 gemstones are still being polished by master craftsmen in Israel. However, the Indian low-cost labor intensive polishing of diamonds dominates the Indian global exports and only 2/3 of the global polishing revenue reaches India. The Indian traders believes that production of imitation diamonds is not yet a realistic threat to DeBeers. So, they do not want to set-up shops to sell imitation diamonds. 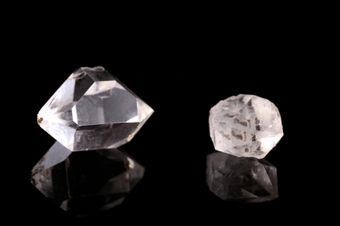 Most of the rough diamonds come from two (2) channels: either from DeBeers or "the open market," mostly in Antwerp, Belgium. The main player in the wholesale of rough diamond trade is DeBeers and 37 Indian firms buy directly from them. The Indian traders either fly to London to DeBeers or to the open market in Antwerp every five weeks, where they are shown 50 rough diamonds on a lit table. They have 15 minutes to look and decide whether to purchase these rough diamonds or leave them. In that short time, the buyer rapidly inspects the 50 diamonds. The Indian trader tries never to say no when doing this transaction with DeBeers, because, if they say no too often, they'll get cutoff from access to future transactions. There is uncertainty of revenue for the Indian traders when purchasing rough diamonds in this fashion. As a rule, the buyers buy batches of rough diamonds, polish them, figure out ways to sell them and turn a profit. Some of the family members (family-owned businesses) sit outside the country, spend some time in London and Antwerp to buy roughs, and sets up the distribution channel for selling polished diamonds. Depending on how the polished rough diamond looks, such as, none to many blemishes, the cost of the carat per gemstone could go anywhere from $300 per carat with many blemishes to $12,000 per carat for a flawless perfect diamond. Most of these diamonds are polished and cutted by laborers in small companies in Gujarat using laser-driven machines that were made in and came from Israel. In today's news, the financial crisis or meltdown have made it very hard for Indian laborers to continue with their operations of polishing and cutting diamonds to sell to consumers in order to make revenues for their country. As many as 150,000 Indian laborers have been laid-off from work within the last year in Surat, India where a large number of rough diamonds are polished cut into gemstones.